I live in a country which just adopted to Daylight Savings Time last year. Most time synchronization services and devices don’t recognize us as a DST observing country. Luckily, for Windows users, Microsoft has several ways to help you – one of which is its good old Time Zone Editor utility. Windows timezone database is stored in the registry. Though you can edit and manipulate the registry keys directly, it isn’t recommended if you don’t really know what you are doing. Alternative ways include optional hotfixes that Microsoft releases, but they aren’t always available for all operating systems. 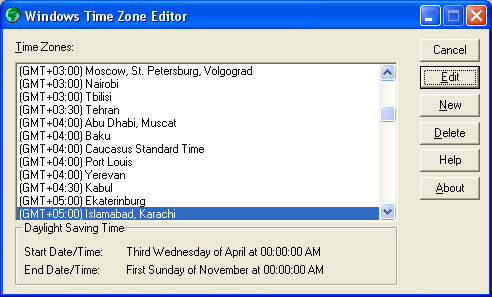 The only safe way left is to use the Microsoft Time Zone Editor Utility from the old Win9x/NT days. 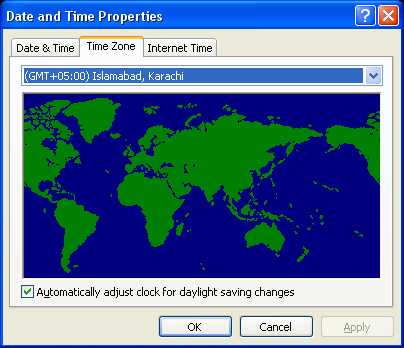 This utility can manipulate existing timezones on your system as well as create new ones. And is a safe way to make changes to your OS without having to risk corrupting the registry. Edit your current time zone. It would have the default time zone already selected. Just click the edit button. In the Edit Time Zone dialog, change the name or the abbreviation of your Time Zone if you like. If you’re time zone isn’t set for DST yet, check the Automatically set Daylight Savings Time checkbox. Enter the day, month and time from which your DST changes take effect. For Example, in the screen shot, I set it to April 15, 2009, 00:00. That is, 3rd Wednesday in the month of April. Similarly, set the date for the end and set the amount of time shifted. +1 sets the clock ahead, while -1 sets it an hour back. Click Ok and Close the editor. You can verify your updated settings by changing your Time Zone in Windows Time settings. 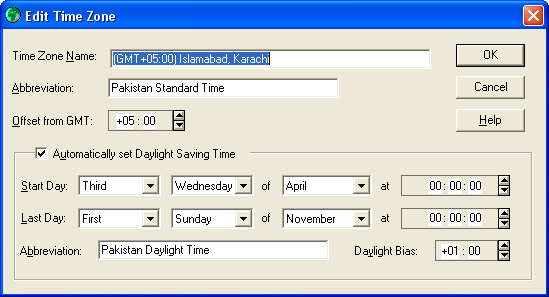 Direct Download Microsoft Time Zone Editor Utility (80KB). Windows timezone database is stored in the registry. Ran 15 queries in 0.197 seconds.